Apple's tablet, iPad Pro is amazing with its small size and powerful stuffing. Unlike the 12.9 inch Retina display, the iPad Pro is equipped with 9.7 already lower resolution - 2048x1536, but also provides clear text, bright saturated colors and high contrast. The display has an oleophobic coating to keep the screen clean. Now, viewing and editing photos or intense 3D games will be more interesting for you. The iPad Pro comes with the iOS 9 operating system, which includes active help, powerful search and improved Siri capabilities. 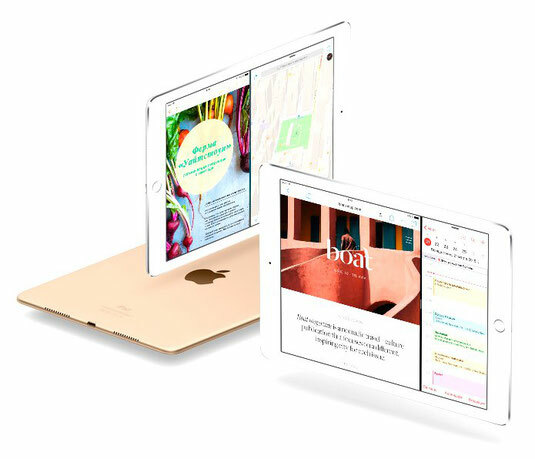 The multitasking function, designed specifically for the iPad, which will allow multiple applications to be used simultaneously, the built-in applications become faster at startup. More impressions with every touch. 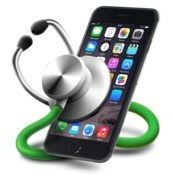 IOS 9 is the most advanced, intuitive and secure mobile operating system in the world. All of its functions - from multitasking to Night Shift - will help you to maximize the potential of the iPad. The heart of the iPad Pro with a 9.7 matrix is the Apple A9X processor with the M9 coprocessor. This 64-bit chip of the 3rd generation will easily cope with all the tasks posed, like the creation and visualization of 3D models. In addition, the iPad Pro can play three simultaneous video streams in 4K format. 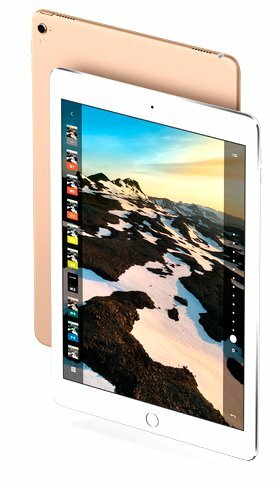 The Apple A9X processor is 1.8 times more productive than the A8X processor in the iPad Air 2, while offering high speed of operation and responsiveness. 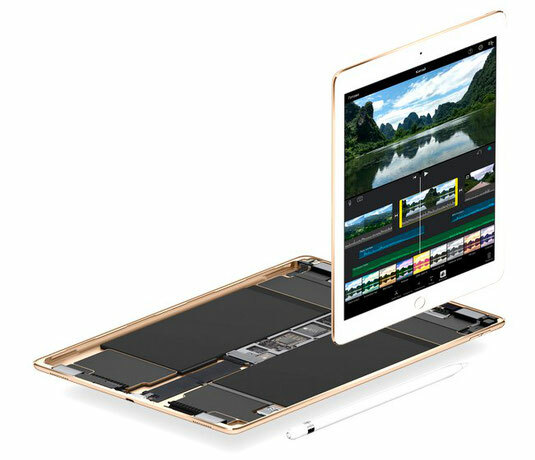 The A9X processor with 64-bit architecture allows the iPad Pro to easily cope with tasks that previously required the power of a workstation or PC. Not to mention those for which the PC simply is not intended. A9X provides not only impressive power, but also an effective battery life of up to 10 hours. The performance of the A9X processor is 1.8 times higher than that of the iPad Air 2, and the speed of its response is simply amazing. 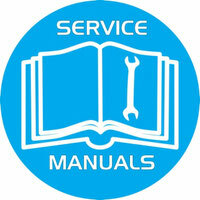 Therefore, even such complex processes as the installation of 4K video, occur incredibly fast and smoothly. The graphics performance of the iPad Pro has almost doubled compared to the iPad Air 2. Fast rendering of detailed models, smooth animation and realistic effects guarantee you a complete immersion in your favorite games and applications. Game by the new rules. Metal technology optimizes the performance of the central and graphics processors, so developers can create incredible applications and impressive console-level games. Among the advantages of the iPad Pro are powerful cameras and a fingerprint sensor Touch ID. Back camera iSight on 12Mp with a True Tone flash, can shoot photos and video in 4K format, and offers a variety of picture modes. 5 megapixel front camera FaceTime HD allows you to communicate with friends or loved ones, and shoot selfies. All items are in the smallest detail. The iPad Pro has two excellent cameras - on the front and back panels. The iSight camera on the model with a 9.7-inch display is equipped with a 12-megapixel camera iSight, which allows you to shoot 4K video, slow motion video at 240 frames per second and Live Photos. And this is the first iPad with a True Tone flash, so the skin tone in the photos looks natural in any lighting. The newest matrix of FaceTime's front-facing HD camera makes video calls even more realistic. And the 5-megapixel FaceTime HD camera with Retina Flash and True Tone technology on the iPad Pro with a 9.7-inch display is ideal for selfie shooting. Even with these characteristics, the tablet boasts economical power consumption, providing up to 10 hours of battery life on a single charge via Wi-Fi and up to 9 hours when using cellular (4G). Apple iPad Pro supports many additional accessories, including a keypad Smart Keyboard and an Apple Pencil stylus for easy storage of notes. A new word in the keyboards. 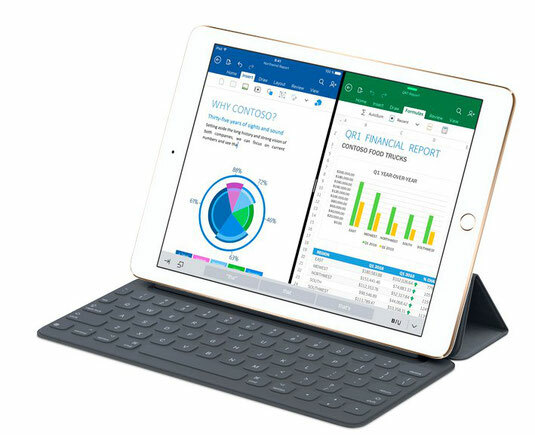 Whichever iPad Pro you choose, it has a Smart Keyboard.2 The combination of new technologies and materials has allowed us to create a compact and surprisingly thin keyboard that also serves as a solid and lightweight cover. And thanks to the Smart Connector interface you will forget about wires, connectors and the need to create a pair. Just connect the keyboard and start working.